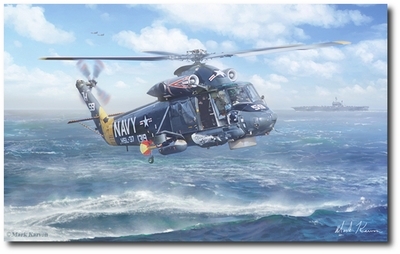 Entering service in 1962, the SH-2 Seasprite proved to be a durable and adaptable design. Remanufactured in 1968 to utilize two jet engines, the Seasprite was a powerful performer. The Seasprite was used in various roles including rescue of downed airmen in Vietnam and antisubmarine missions as the SH-2F. The last Seaprites to serve with the US Navy were retired in 2001 but the upgraded SH-2G Super Seasprite continues to serve with the Royal New Zealand Air Force. 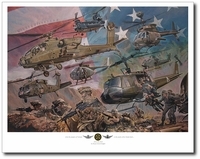 This print depicts the SH-2F Seasprite as it appeared in service with the �Easyriders� of HSL-37.